An architect is someone who simply plans and designs the structure of buildings. From the tallest to the most beautiful buildings that quickly catch our attention, architects are the ones behind their construction. They not only design buildings of different appearances but also make sure that their design is such that it ensures the safety of people first. Gone are the days when architects used to sketch designs using pencils and pen. Now, just like people of all other professions, they too are becoming tech savvy. 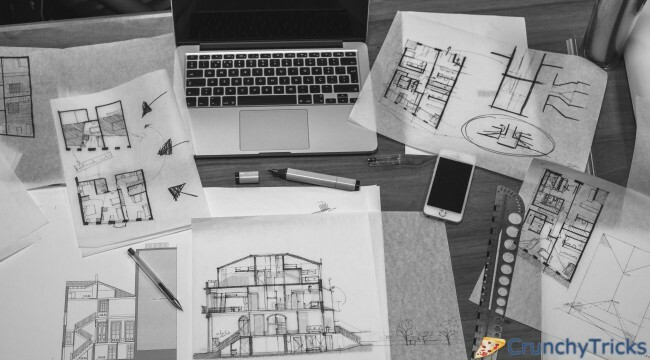 Various architectural apps provide the best tools and features to an architect who wants to design a new structure. Here I have mentioned 10 Best Architectural Design Apps for Android. AutoCAD is the most popular computer aided designing. It has refashioned the field of architecture and infrastructure and hence, is highly demanded and used by modern architects. AutoCAD 360 is an app that highly recommends for architect and is the official AutoCAD mobile app. It uses GPS integration to make your designs realistic. You can view and edit two-dimensional and three-dimensional drawings and even upload or open your files anywhere. The app has other additional features advanced drawing and editing tools, larger file support, extra storage, etc. Using this app, you can present or share your drawings with your clients and colleagues. It has a feature called asBIMx Hyper-model. You can view your designs in a way that you’ll feel as if you were walking through a real building. Pro model is also available for the app. Autodesk SketchBook is an ideal app for sketching, designing or painting. You can put all your ideas in your design while drawing without any hesitation that you are making a digital sketch. It is the perfect app for the incredibly creative ones. The fluid pencils and simply original paintings that it provides are like never before. And, after sketching or doing an excellent art, you can save your artwork in SketchBook's gallery. Architect’s choice is the magazine that is a must for all the designers willing to work and succeed. They get inspired by the work of other designers and their latest and outstanding works across the globe. This app keeps you updated with the most recent trends and changes happening in the architectural world. For the ones who are using AutoCAD 360, it’s possible for you to see how your ideas and thoughts will function in reality. Autodesk Formlt automatically syncs to AutoCAD 360 app so that you can transfer your designs which you want to edit with more elevated softwares. It provides you with numerous shapes for designing. The app has various tools for further improvements in designs and even has multi-touch gesticulations. Pantone is international language for colors. So, now we have a hint as to what this app is about. The myPantone app gives you route to the whole of Pantone catalogue. The catalogue has over 12,500 colors. The app allows yo to create and share color pallets. MagicPlan quickly measures floors and creates professional floor plans along with work estimates. Simply by taking pictures from your phone’s camera, the app can measure rooms and create floor plans and complete estimates. What can be more convenient than this? You can create a map within few minutes. Here’s the solution to the superstitions related to the direction of the Sun. And, also if someone wants a house facing towards the sun or against the sun, this app is there to help you. The app has digital flat view compass which will show you the path of the sun all over the year. It has a highly interactive augmented reality 3D view that shows you the amount of sunlight your building will receive. PadCAD is a convenient and easy to use Computer Aided Designing (CAD) app designed for small drafting projects such as home additions, small remodeling projects and even site surveys. For a newbie in this field of architecture, this is the perfect app! Once you create a design, you can export that design to a professional CAD. As the name suggests, a handy carpenter or in other words you have a carpenter in your hand if you have this app on your phone. It is extremely light and a beautiful carpenter tool kit and a must app in every house. There are five tools in one which includes a plumb bob, surface level, bubble lever bar, steel protractor and a steel ruler.